James Simmons was born in 1795 in London, the son of Jewish parents Nathan Simmons and Sarah, nee Frankel, of Crown Street, Soho. He married Agnes (1801–90), the eldest daughter of Samuel and Agnes Thorley at St Peter’s Anglican Church in Richmond NSW on 14 November 1821. He died on 2 May 1849, aged 55, survived by three sons and four daughters. He was buried ‘with great reverence by the Sydney Synagogue’ in the Devonshire Street Cemetery, later relocated to Rookwood. His son Isaac drowned when the Dunbar was wrecked at Sydney Heads on 21 August 1857. He was the brother of Alderman Joseph Simmons. Together with his parents and prison escapee Joseph Richardson, James Simmons was charged with burglary offences in June 1813. With his death sentence commuted to 14 years transportation, James Simmons arrived in Sydney on 27 January 1815 on the convict ship Marquis of Wellington. Also on board was fellow Jewish convict and future Alderman Moses Moses. He was assigned to the Richmond and Hawkesbury areas, receiving his ticket of leave in 1819. In 1823 he began his mercantile career by building the Emu Warehouse on the corner of George and King Streets, Sydney, offering a wide assortment of imported goods and drapery. In 1828, on the corner of George and Barrack Streets, he erected his landmark Jerusalem Warehouse and by 1829 had his auctioneers license. In 1833, and again in 1842, he revisited England to purchase stock, chartering the Adelaide to bring his family back to Sydney. 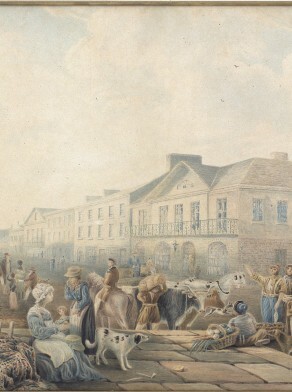 Although his absolute pardon was not granted until 1842 and he was declared bankrupt in 1852 (and possibly again in 1857), Simmons became a wealthy merchant, a property owner and was exporting goods to the London Market. In 1849 he leased his Jerusalem Warehouse to David Jones & Co. James Simmons and his son Isaac owned Enmore House and its surrounding nine acres at Newtown. In 1841 they sold this to Jacob Josephson, father of Alderman Joshua Josephson. Simmons Street in Enmore is named for Isaac or James Simmons. James Simmons was an auctioneer/landowner on the Provisional Committee of the Sydney Railway Company, which planned Australia’s first railway in the late 1840s between Sydney and Parramatta. Although he married a non–Jew, James Simmons took an active part in Sydney’s Jewish community and insisted his children be raised in the Jewish faith. James Simmons became the first Jewish Alderman of the City of Sydney when he was elected Councillor for Bourke Ward, 1 November 1848 to 29 January 1849.